Have you ever wanted to be a board game playtester? To get in on the ground floor and shape the future of a game with your feedback? 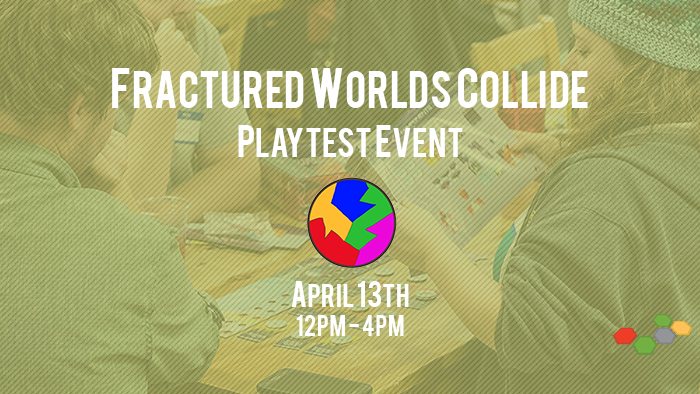 Now's your chance, with Fractured Worlds Collide! A singular event ripped open holes between different dimensions and a realm connecting them all that became known as Doubria. It is an interdimension where long abandoned ruins lie scattered everywhere still holding powerful artifacts that are an irreproducible combination of technology and magic commonly referred to as Mystek. Forces from each dimension confront each other within the strange lands of Doubria; seeking control of Mystek for personal use… or just for the carnage against new flesh. What will happen when fractured worlds collide? Fractured Worlds Collide is a miniatures wargame pitting varied forces from across different dimensions. Steampunk soldiers form firing lines to blast away at high-tech undead. Flame-wreathed ninjas pit their chi against anthropomorphic grizzly bears wielding grenade launchers and miniguns. Come learn about this new game from local creators. We are interested in feedback as we take another big step in creating this game. Please join us and learn about the story and the rules; play test a round of combat or a full game!